Hosting little ones on your big day? Here are some items to have on hand to ensure good behavior (and calm parents!). 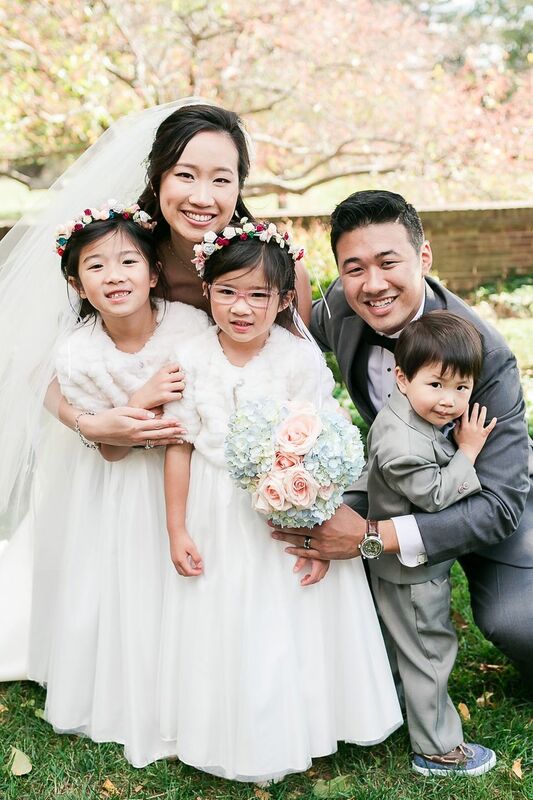 When it comes to kids at weddings, there are two camps: those who love the idea of having adorable ragamuffins present on their big day (ah, the cute photo ops!) and those who are firmly against (ah, the tantrums!). If you’re pro-kids at weddings, it’s important to realize that there’s more to inviting little ones than just putting “and family” on your invitations and calling it a day. 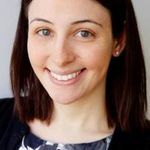 Kids have very different needs than adults, and while their parents will likely take care of most of those needs, there are certain things you can do, as host of your wedding, that will make the children’s (and parents’) experience an enjoyable one—and perhaps make good behavior even more likely. Here are a few items that you should have on hand for kids at weddings. These items are really must-haves for most weddings where there are children present. The roles of flower girls and ring bearers are decidedly less intense than those of your bridesmaids and groomsmen. But walking down the aisle is a big job for kids at weddings, and your littlest attendants have earned some sort of gift. These presents are, in the best-case scenario, rewards for a job well done, and in the worst-case, bribes. Be sure to factor in each child’s age and interests when purchasing a gift, but we’ve got a few favorites that might inspire you. If there’s one eternal truth about little ones, it’s that they are constantly spilling drinks. All. The. Time. And kids and the heavy, breakable glassware that’s frequently used at weddings do not mix. We recommend providing cups with lids and straws to help avoid spills and broken glassware (plus ruined clothing and soiled décor). And to be more environmentally friendly, these cups should be reusable so the kids can take them home as an extra favor and memento of the day. Most kids have pretty simple palates, preferring items like chicken tenders and pasta to trout almondine and beef en croute. If your wedding menu skews more toward “adult food,” then ask your caterer if a child-friendly alternative can be prepared. 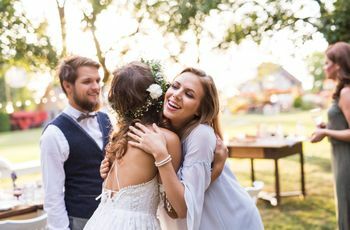 However, if your wedding menu is more on the casual side (a buffet of BBQ favorites, for example), your younger guests will likely be just fine with the offerings. And of course, there’s the ultimate crowd pleaser for guests of all ages—wedding cake! While being kids at weddings can be a lot of fun (Loud music! Cake! ), there may also be some moments that are a bit, well, boring. Yes, you might think your first dance is utterly breathtaking, but to a three-year-old, it’s just time she has to stand still and be quiet. And your best man’s toast? Yes, it may be hilarious, but your five-year-old nephew probably won’t get the jokes. To help keep kids occupied during these potentially less-than-fun moments, provide a few quiet and neat activities. We particularly like these invisible-ink activity books or any sort of sticker book. Anyone who’s ever tried to eat a meal while balancing a toddler on their lap can tell you it ain’t easy. If you’re hosting children ages two and under, it’s a good idea to ask your venue or rental company to have highchairs on hand. Not only is this an ideal way to keep little ones safe and contained, it allows their parents to have their hands free so they can enjoy their dinner a bit more peacefully. Many couples create restroom amenity baskets which can include items such as spray deodorant, Band-Aids, dental floss, aspirin, and the like. If you’re having younger guests, you may want to add a few more items to these baskets, including baby wipes, disposable changing pad covers, and plastic bags for soiled diapers. While most parents will have these items with them, it’s always helpful to have extras in case of emergency! 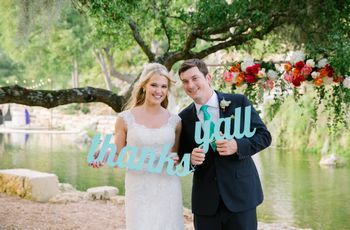 The following are not necessities, per se, but if you’re able to factor these into your wedding schedule and budget, it will certainly make things easier for kids at weddings (and their parents, too!). If you’re hosting lots of children, you might want to look into a babysitting service that specializes in weddings and events. These services often create a playroom or area that’s kid-friendly so that the little ones can have their own, age-appropriate party, while the adults celebrate at the reception. Yes, these babysitting services are certainly an added expense, but it can be totally worth the peace of mind. When it comes to kids at weddings, timing is everything. Younger children are often go to sleep on the earlier side, and toying too much with their schedules can mean crankiness and general misery for all involved. 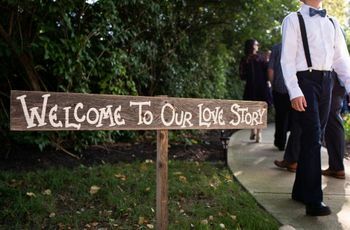 As you consider timing for your wedding day, consider making your ceremony on the earlier side to increase your chances of a well-rested, well-behaved group of little ones. A ceremony that doesn’t begin until 8 p.m. will be stressful for parents to keep their littles awake and happy. 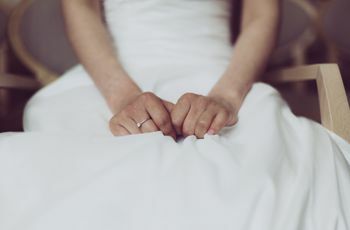 Of course, this is your wedding and you can plan it however you desire, but it’s important to be aware of these things—if a super-late ceremony isn’t necessary, is it really worth your ceremony being disturbed by a screaming child? Your call.